On May 2, 2016, a Brazilian judge ordered cell phone carriers to block access to the messaging service WhatsApp for 72 hours. The order applied to the whole nation of Brazil—100 million WhatsApp users. Worldwide, Internet censorship events happen frequently. They may occur in countries like Brazil or in oppressive regimes like Egypt or Saudi Arabia. We want to understand better what happens during these events. If we can watch certain data points, we can observe, for instance, whether or not our tools are efficiently circumventing such blockages. The Tor Project has a set of tools that can help us learn these answers. We can not only identify whether a censorship event has happened, but see how it was accomplished by the censor, and observe if people are using our tool to bypass it. The Open Observatory of Network Interference (OONI) is a Tor project focused on detecting censorship, surveillance, and traffic manipulation on the Internet. For the recent WhatsApp case, OONI published a report showing that the Brazilian mobile carriers blocked WhatsApp’s website through DNS hijacking. While OONI tests are not currently designed to directly test instant messaging (IM) protocols, OONI did monitor access to the WhatsApp website. This data allows us to analyze the censorship mechanisms used, and to determine if tools like Tor can bypass the block. 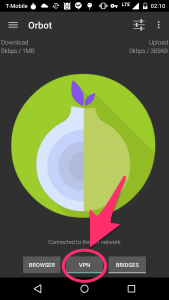 In this case, an Android user could download Orbot, a Tor proxy tool for Android, and successfully bypass the censorship with its VPN mode. As soon as the blockade was announced, we began promoting key tips in Portuguese on social media and elsewhere to instruct Brazilians about how to bypass the WhatsApp blockage on Android with Orbot. For Orbot statistics, we don't use Google Analytics or other system to track Orbot users, other than what Google Play can show us about installs and uninstalls. Based only on that, Orbot's active install for Brazil on May 1st was at 33,458. On May 2nd it went up to 41,333. Taking a look at the number of downloads for Orbot in Brazil, we saw a 20% to 30% increase in the rate of downloading on those days. 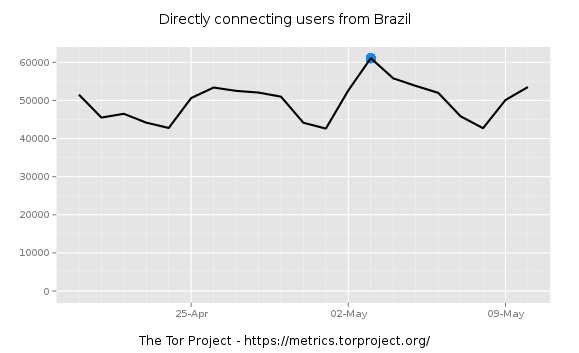 There was a similar increase on the Tor network, where the average number of daily direct connected users for Brazil, went from ~50,000 to 60,000 in 24 hours. Our metrics.torproject.org portal, which hosts data visualizations from our network, also caught the circumvention event. The little blue dot represents the fact that something is happening in the region. Is great to see that even for very sudden and short-lived actions (the block was lifted in Brazil after about 24 hours), we were still capable of capturing it in our data. You can read here about how we do it and the precautions we take while collecting such data so we don't affect user privacy. We know that we are talking about a small number of users in a world of 100 million, in the case of WhatsApp. There is still a lot of work to be done to help people become aware of such tools. However, it is great to see our projects coming together to tell this story. Our experience with the WhatsApp blockage in Brazil demonstrates the potential these efforts have to provide us with information about censorship events and to help us build circumvention mechanisms against them. We are working hard on new features for these tools; for instance, we want to deploy more mobile network tests for OONI and better visualizations of our data so that others can easily explore and learn from them, and we continue to improve user experience on our apps. Keep an eye on this blog as we develop this work! Protecting the ability of ordinary people to communicate and the ability of journalists to report freely on political and epidemiological dangers which affect (at least indirectly) the entire Western Hemisphere is one of the most important things any human/civil rights type organization can do. The amazing thing is that this is just one of the essential things which require Tor. Or a small number of other highly endangered technical means, including WhatsApp, which enable us to read uncensored news and communicate what is really happening in Brazil, China, USA, France, East Africa, &c.
Thanks to everyone at Tor Project for all your hard work--- Tor is making an enormous positive difference in the world at a time when almost everything else seems to be falling apart! Não só o bloqueio do Whatsapp me preocupa, mas também a CPI dos crimes cibernéticos pode colocar a liberdade dos brasileiros na internet em risco. Not only blocking Whatsapp worries me, but the CPI of cyber crimes can put freedom of brazilians on the internet at risk. To avoid misinterpretations: "CPI" = " Parliamentary Investigation Committee" in English. Excellent work team Tor in giving humanity a chance to voice themselves! Thank you for this post. Even though I already knew about the Tor Project, it was only with the blockage that Orbot got in my radar. I've been using it ever since and also discovered Orfox, but it's still in beta. There is something wrong with the images, I cannot see them here or with the Internet Archive. Nice that you are using Orbot now! Sorry about the images, was a temporary problem. Should be all good now! And ISA, how many other brazilians just moved to Signal? We don't know this number. We don't know this number. But I think the app that got more 'whatsapp' users was Telegram. But I believe is just because people are more aware of it than the other options. Thanks for this update, isabela. It must be gratifying to be a part of helping to provide an medium to circumvent Internet oppression. I was wondering, though, if as a result of the increased downloads of Orbot, was there a similar increase in downloads of TOR Browser? Thanks for your time. And the fine works of the TOP Project! Thanks! I only looked at Orbot for this one, since most people would be on mobile. We are working on making it easier for us to know the download information for Tor Browser, right now we don't have an easy way to look at it either. But soon we will fix that! hm and how can it help privacy of tor users? why do you need that data? why do you want to fix it? are all the other tor problems solved? or who order you to fill such reports? fine but all orbot users over the world are now in nsa files through google.nsa! Es possible bajar una version en Espanol, solo tienes que seleccionar el idioma en el dropdown menu. Congrats on the amazing work. Could you make a version of Orbot for iPhone?